I’m a little nervous but mostly curious and excited about what the next 48 hours have in store. 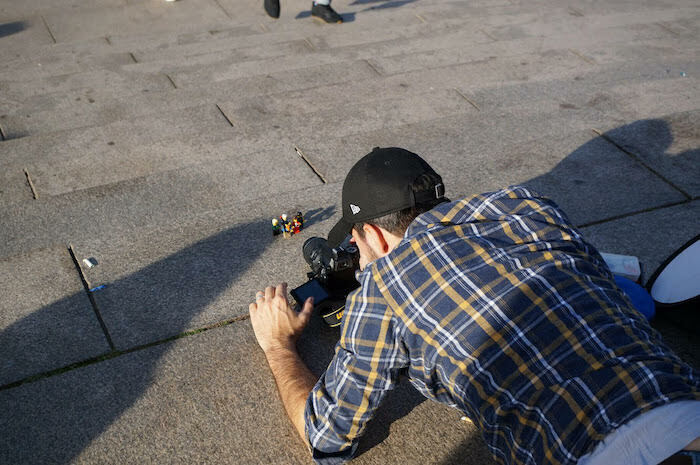 Public toy photography isn’t something I’ve thrown myself into or ever advertised to my non-plastic human friends. 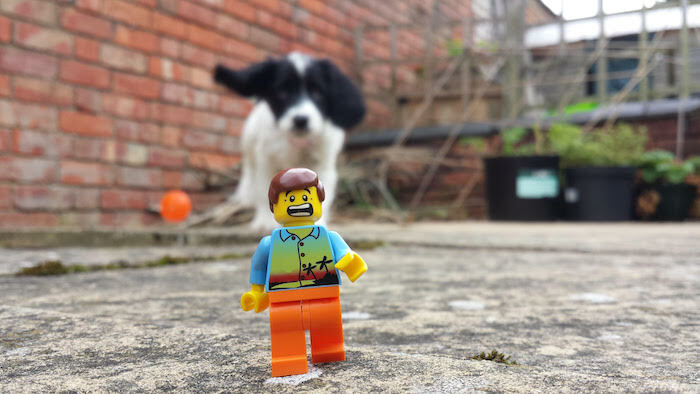 My dogs however do watch in bemusement while I position plastic people in the privacy of my garden and sometime get involved in the pictures too. It’s a dog eat LEGO world out there. 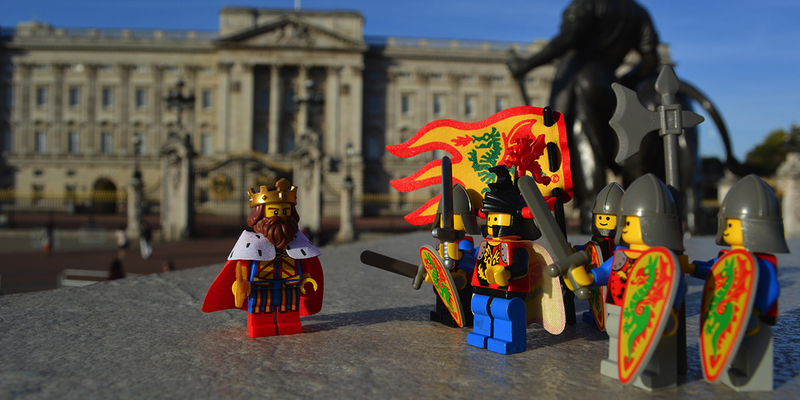 LEGO figures have been my source of inspiration and the outlet for my limited creativity for a couple of years now. But until recently I’ve only taken pictures in a light box in my basement or if I’m feeling adventurous, and British weather permitting, I’ve stepped into my garden to try out new ideas. But never ‘in public’ – that’s far too conspicuous despite shooting subjects so tiny. I, with a bunch of strangers (who I’m now pleased to say are friends) were stood, sat or lying down outside Buckingham Palace and while I got on with shooting, the hustle and bustle was ignored and I found my confidence growing. Every man and their dog visiting London goes to try and see the Queen, so it was predictably busy shortly after I arrived there in the morning. 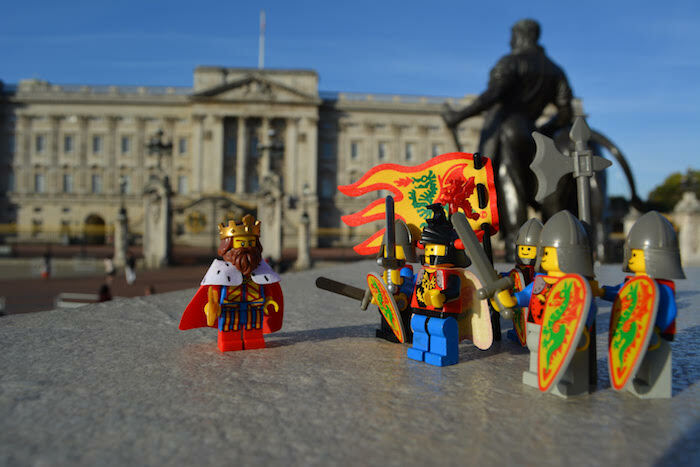 Old me would never have dug out a plastic box of LEGO soldiers and set them up in front of dozens of tourists. Most of them were curious, some were bewildered, lots were amused and some just plain ignored us. I was with some seasoned Toy Safarists (not sure that’s a word, but never mind) and they were great at engaging with onlookers, answering any questions, handing out cards with their online handles on and even getting some involved. To demonstrate the pros and cons of public photography, while taking a pic of some ninjas (completely normal on a toy safari, right?) there were lots of shadows from the morning sun caused by passers by… usually a pain! But in stepped Stefan from Sweden (otherwise known as @fubiken) with his portable reflector and the photo could be taken. The problem with the shadows before @fubiken saved the day. As the day went on, stopping in the street, by the river, or near one of dozens of tourist hot spots, became practically normal. I was getting into a rhythm and really enjoying myself. I was out of my comfort zone but felt safe with likeminded individuals who all shared toys, held reflectors or lights in place and happily gave tips and advice. Now my photos from the safari aren’t great. Some are blurred or didn’t come out how I hoped they would, but I’m now more determined to practise, practise, and practise and doing it out and about doesn’t phase me anymore… but I’d love to be doing it with friends again. If you’re considering going on safari, do it. You’ll never be able to shoot everything you want, or be able to carry all the toys you could need, but it doesn’t matter. If you’re only used to shooting indoors, a world of exterior environments is really great to inspire impromptu pictures! Previous PostHow do you Achieve Unlimited Power? Thanks for sharing your experience, B.A.D.Lego! It’s so great to have like-minded people around to shore up our confidence, help with lighting, and share the fun. I love hearing stories from toy photographers who try something new, whether it’s getting out in public to do some shooting or customizing a figure for the first time. Glad you had a good time and made some new friends!